1. Place all dry ingredients into a food processor and pulse to evenly distribute - or place dry ingredients into a large bowl. 2. Add cold, cubed butter to the flour mixture, pulsing - or use a pastry cutter or fork to cut butter into the dry ingredients. 3. Pulse until the mixture resembles coarse meal. 4. Place mixture into a large bowl and set aside. 5. Combine the egg and the buttermilk together in a small bowl. 6. Create a well in the flour mixture, gradually mix in the egg mixture with a fork. 7. Mix the dough until it forms a ball. 8. Allow dough to rest in refrigerator for 30 minutes. 9. Cut the dough in half. Using extra Einkorn Flour to dust working surface. Roll out one portion and drape to fit the pie dish. Prick. 10. Bake in a preheated oven at 350˚F. 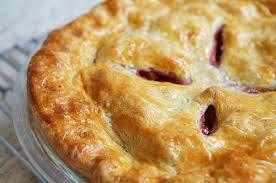 *For baking the crust without filling: Pierce the bottom of the crust all over with a fork. Bake 10-20 minutes or until barely golden. *For baking a pie with a filling: bake for about 45 min to 1 hour or until golden-brown depending upon your pie and the oven. - When combining the flour with wet ingredients, be careful not to over-work the dough. - Resting the dough is important! It allows the water molecules to evenly distribute throughout. The addition of egg gives a golden brown, tender crust. Buttermilk adds fantastic flavor. It can be made ahead of time and stored in the freezer. Recipe yields 2 pie crusts. Use remaining portion for an additional pie or drape over a filled pie plate and decorate. Fill with your favorite pie filling, sweet or savory.